Nahar teaches students how to do a mountain pose during her presentation. Nahar said she uses so many simple hand gestures because she wants students to be able to remember them after the presentation and use them when they tell stories. 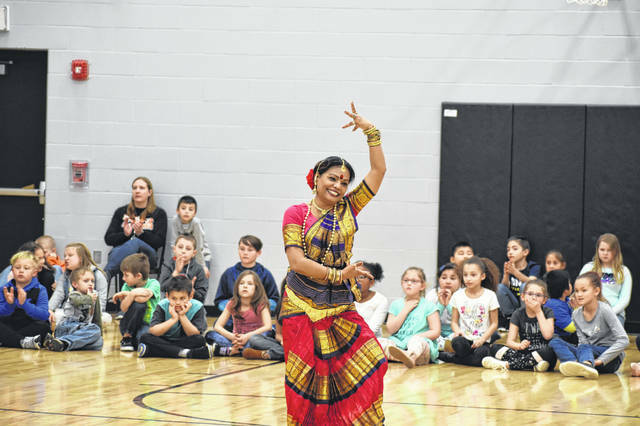 Bharatanatyam performer and presenter, Sultana Nahar, performs a dance Friday afternoon at Woodward Elementary School. Nahar taught students a couple of dances and used the dances to tell stories from Indian mythology. Just before heading off to Spring Break, students at Woodward Elementary got a presentation and performance of Indian dances. Bharatanatyam performer and presenter, Sultana Nahar, visited first-grade through fourth-grade students Friday afternoon where she taught students about Indian culture and demonstrated several dances. Woodward Principal Ryan Malany introduced her in the gym at Woodward and encouraged students to use the opportunity to learn about another culture. One of the things Nahar taught students was “Namaste,” a traditional greeting in India, which means “I honor you” and taught students how to bow slightly during the greeting. Nahar also showed off dances she choreographed to go along with stories and taught students how to do them step by step. One dance in particular tells the story of the Rahu, a figure in Indian mythology, and the solar and lunar eclipse. Nahar said the story is mostly told through hand gestures and movements. Another dance involved animals like birds, fish and butterflies, all of which had their own unique hand motions. Nahar said she hopes students will remember some of the moves and gestures as they continue to learn about the world. Nahar said she enjoyed dancing with the students at Woodward and hoped they enjoyed it and learned something. As students left the gym at Woodward, they passed by a table of Indian items and artifacts, which Nahar encouraged them to examine. Nahar said she does numerous presentations at libraries, schools, senior centers and even correction centers. Nahar said she choreographed the mythological stories into dances herself and hopes to share more mythology with students and others in the future. Malany thanked Nahar and the end of the presentation and told students this was a good way of learning how movements can mean different things. https://www.delgazette.com/wp-content/uploads/sites/40/2019/03/web1_DSC_0084.jpgNahar teaches students how to do a mountain pose during her presentation. Nahar said she uses so many simple hand gestures because she wants students to be able to remember them after the presentation and use them when they tell stories. 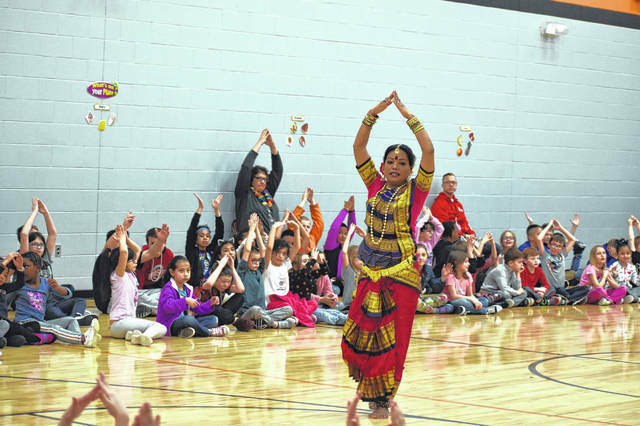 https://www.delgazette.com/wp-content/uploads/sites/40/2019/03/web1_DSC_0184.jpgBharatanatyam performer and presenter, Sultana Nahar, performs a dance Friday afternoon at Woodward Elementary School. Nahar taught students a couple of dances and used the dances to tell stories from Indian mythology.